This post collects forms and ideas that I use when pondering product and/or business ideas. See this template. Business Model canvas. 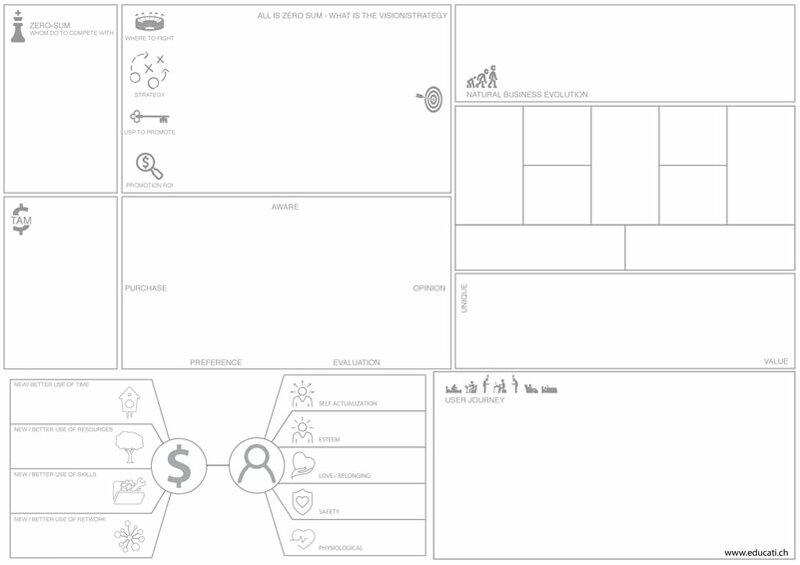 See this post – explaining the Business Model Canvas. Adding value. See this page – adding value to the user and to the business. Zero Sum – is everything (in business context) a zero-sum game; so-called zero-sum economics? Zero-Sum represents the situation where “each participant’s gain or loss of utility is exactly balanced by the losses or gains of the utility of the other participants. If the total gains of the participants are added up and the total losses are subtracted, they will sum to zero. Thus, cutting a cake, where taking a larger piece reduces the amount of cake available for others, is a zero-sum game if all participants value each unit of cake equally.” In real life situations – apart from eating apple pie of course – this seams hardly the case. But if you look at an individual person having a limited amount of resources to spend each day (time, money), can you consider this a zero sum situation? What product am I competing with on utility when designing my great and new gizmo pro? User journey. See this post – Our digital day. Natural business evolution. I noticed that when defining a business, many stop thinking at the mark one product. But in the same way you create a MVP before releasing the already partly envisioned Mark one, it helps to have an idea of how your future business is going to look like when you are creating the start-up. So you can steer and decide wisely. Sales cycle. We all know the standard sales funnel but I would recommend to see it as a cycle, not a one-dimensional funnel. Every step in the ‘cycle’ is a basis for one of the next steps. How does ‘forming an opinion’ of our Gizmo pro become the awareness of something completely different? Total Accessible Market (TAM). Agreed, when pursuing your passion the TAM is of no relevance. In all other cases it is. What market are we perusing? What is the size of it? Uniqueness vs Value. Value already is covered by ‘value add’ and the Business model canvas’ but I added this just to make sure I am keeping in mind what it is that is unique. These is what I am using as sketch-book, or scrap paper to ideate new product – which always means – business ideas. What do you use?